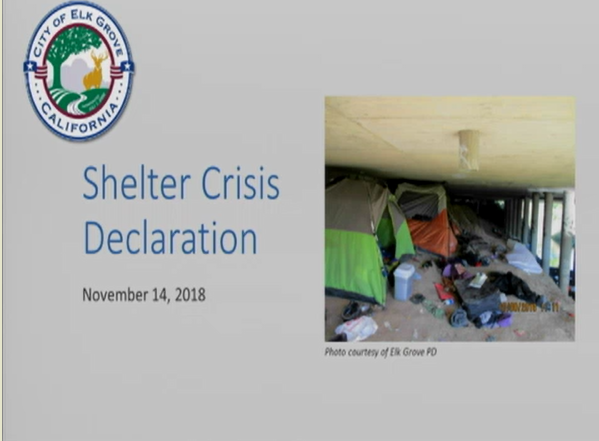 By a rare non-unanimous decision, the Elk Grove City Council decided to declare a shelter crisis at their Wednesday, November 15 meeting so they could obtain part of $500 million in funding recently authorized by the California Senate Bill 850. The council voted 3-2 in favor of the administrative move with Mayor Steve Ly, Vice Mayor Darren Suen and Council Member Stephanie Nguyen supporting the move. Opposing the move were council members, Steve Detrick, and Pat Hume. By declaring the crisis, the city will qualify for the money under the HEAP program - Homeless Emergency Aid Program. The one-time funding will allow Elk Grove to participate in regional programs to address homelessness. According to information presented by Sarah Bontrager, the city's housing and public services manager, people identified as in-need in the Elk Grove community will be eligible for services. Bontrager's written report to the council noted, "declaring a shelter crisis also allows jurisdictions to house homeless persons in designated public facilities, and reduces building standard requirements for such facilities in the event that strict building code compliance would hinder mitigation of the shelter crisis." The facilities described by Bontrager would be similar to those currently operated such as the Grace House in Elk Grove and will be located throughout Sacramento, unincorporated Sacramento County, and possibly Elk Grove as well as apartments. During the council's 30-minute deliberation, council members Hume and Detrick expressed reservations on the declaration. Acknowledging addressing homelessness is a touchy issue, Hume said the program does not address issue contributing to an individual's homelessness and that he does not like the necessity of immediately declaring a crisis to receive the funding. "I'm not comfortable having a gun held to my head and saying 'you got to pass this by December 31st or else you miss out,'" Hume said. "I don't even know what I will be missing out of at this point." Detrick said he liked the regional approach to the issue but inferred that the money should be spent on housing homeless people in unused county-owned structures. At a May 29 meeting on addressing homelessness, Detrick suggested facilities such as the unused former Boy's Ranch and juvenile hall facilities be used as a housing solution, but faced pushback from Elk Grove Mayor Steve Ly who noted the structure were prisons. "One of the things we have talked about in past meetings relative to the homelessness situation, how we can work with the county with their vacant facilities, " Detrick said. Detrick asked Bontrager is any progress had been made on that front. Brontrager said, "the county has not identified any facilities that would be appropriate for a shelter facility." She added their strategy has been similar to Elk Grove's model of locating those in need of housing in residential dwellings. "I've been a big supporter of a regional concept, to cherry-pick homes in Elk Grove, I can't support that," Detrick stated. Council Member Stephanie Nguyen said she supported the concept but wanted some assurances that homeless in Elk Grove would be included in the program. Suen asked Bontrager about if funding from the recently passed Proposition 2 that will provide funding for housing from a mental health fund could replace this short-term source of funding. "We need everything we can get," Bontrager said in response. "So that money is really targeted now towards permanent supportive housing. That takes a while to construct." Bontrager said the city will be unable to enroll any Elk Grove person in the program without this declaration. She added given the tight housing market, people from Elk Grove participating in the program will probably be housed in apartments outside of the city. During the final vote, Nguyen's vote had to be clarified. While she did vote in favor of declaring the crisis, she hesitated and qualified her vote. "I think there are a lot of things that are not out on this," Nguyen said. "I want updates on this as well." Nguyen added that Elk Grove's homeless population is not as in-need as those in other parts of the county, and consequently those needing services here might be overlooked. As the motion was made by Suen in favor of the declaration, Ly noted that Bontrager had asked for additional tools to address the issue, this would provide the city with more avenues to address the situation. "I think it is important to acknowledge the fact the homeless community is here already if it be they have ties to Elk Grove or not, the fact of the matter is that we have to address it, and this is just part of reality."